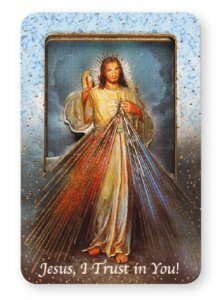 DIRECT FROM LOURDES - 3 Dimensional Wood Plaque Divine Mercy Magnet. 3 Dimensional Wood Plaque Divine Mercy Magnet. 3 Dimensional wood plaque divine mercy magnet with gold foil highlights.